Traveling Marvelous Minsk Belarus – Traveling Epic! It started with a tweet from a would be friend and an invite to speak in Minsk. Would I? Oh wow. Minsk conjures up ideas of the old communist soviet world. Now while still very iconic in communism I have found it very charming, and a mix of old and new. 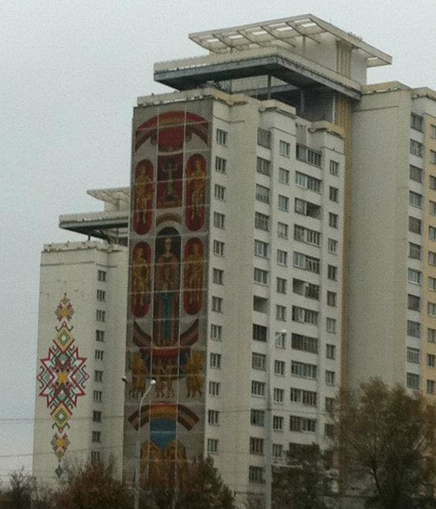 The soviet symbols are very alive in Minsk where in many capital cities of the old soviet empire they have been removed. I met with several Belarussians a couple of times before my visit to Minsk. They were all very intelligent, considerate and faithful friends. One friend helped work out all the logistics for a friend and I to meet him at the border, and we’d meet up with other friends at the airport. Minsk should not be underestimated as a very important country in Eastern Europe with nearly 9 million citizens. I see a bright future ahead in the area of IT for sure. The people I met have very bright minds and a hope for bridging gaps to join Russia or the EU. Belarus appears to have lingering thoughts on the heydays of the former empire and has held onto memories more than many of it’s neighbors. Many of the soviet style communist buildings old and new rise high in the city of Minsk. A city of industry and power, it is a fascinating place to visit. The western world appears to have little knowledge of the fascinating place that Minsk is and how important it has been in history. 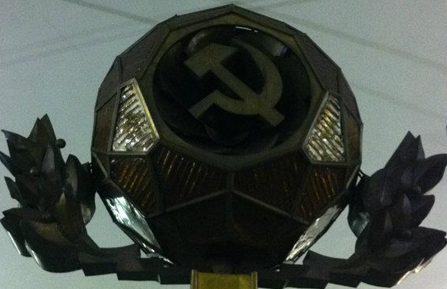 The hammer and sickle appear on many government buildings and even in the tube. Across the street from our hotel was the famous KGB building. It reminds me of days past where CIA vs. KGB and MI6 was something from a James Bond Movie. While those days of distrust may be mostly behind us. I have found great friendship and hope that we can move past that and continue to progress toward an open and peaceful world. The development community in Belarus is a powerhouse. In my experience they are very well versed in the IT field and as well are great partners. I believe a lot of this distrust comes from misunderstanding and something that politicians and diplomats have yet to fully bridge. Wandering the streets of Minsk you’ll be sure to see the symbols of a powerful working class. You can’t blame them for wanting to take care of the poor and removing class, but the power in the hands of the wrong people creates corruption. I had the opportunity to drive across a few hundred miles of the lush and green Belarussian countryside. It’s beautiful. Minsk is up and coming. Beautiful shopping centers, tall apartment buildings, and it offers a lot to its people, with hopefully more freedoms and global diplomacy to come. Today most non belarussian folks… westerners especially, require a Belarussian visa that expires within 90 days or a year. There’s still some distrust, but I believe the rising generation is very interested in connecting and bridging the old ways and looking at new ways to move things forward. Belarus has a lot of history and pride and it doesn’t like to be told what to do. It will require a lot of patience, but I pray it’s coming around. We would do good to try to understand that history, and continue to create friendships and bridge our world. For me, I spent the evening in a banya (spa) in Minsk…creating friendships that will last a lifetime. I have a better appreciation for the Belarussian people, and a strong desire to return. Thanks for the amazing tour of your beautiful country.